Friends many of you might be taking an Android phone into work & might be completing different types of tasks with the help of your phone. But here I am going to tell you about certain things which you should never do with your android phone. So let's start. In the everyday life, nearly everyone uses mobile phones and most of the users use Android smartphones. These smartphones are now becoming an important part of our life. But sometimes these mobiles devices are getting damaged by our own mistakes. 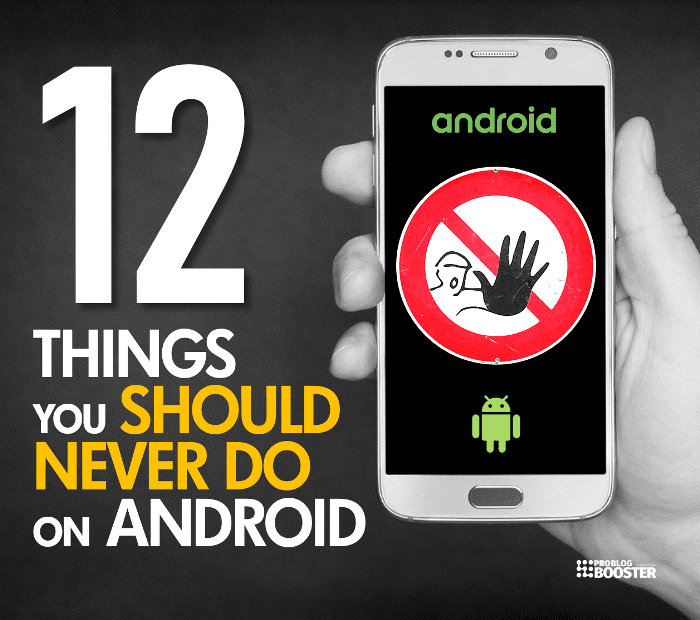 Here today, I'm showing you 12 things you should not do on your Android phone. Friends it is possible that you may have purchased a new phone some shortly or else you are planning to buy a new one or have been using a phone for a long time. But my dear friends here in this list there will be one or other thing that maybe you have been doing knowingly or unknowingly which you should not do. Also, you should check carefully if you are doing these mistakes because these actions might break your android phone. So browse the following information completely. In the previous article I was talking about; Top 15 Must Have Android Apps (2018) Right After Buying A New Smartphone and today I am going to explain the bad things you must stop now doing on your Android device. Before going through this list, I want to tell you that I have covered many of these things in my Android tricks and tips articles. But I felt I make a separate page where I make a list of those things together which you shouldn't try with your android phone ever. So let's see what is there in the list. The very first here in the list is, installing the apps from unknown sources. Means you brought a new phone & you need apps then be sure to download it from official playstore. Many users tend to make a search on Google search engine & try to download the app files and then by installing different types of Apk from the variety of unknown or mostly unofficial websites where many times they come across (cracked) paid apps, (pirated) films etc. So here you shouldn't be done this at all. The first important thing about this is that it promotes piracy which is a wrong thing itself. Other than this, you don't know about their authenticity and my dear friends Google doesn't have any control over the apps that you are downloading from any such websites. So what is there is a malicious code which may be harmful to you any time. In most of the cases, it can also compromise your phone's data. It can leak the data collected elsewhere & you can't monitor such type of apps. Google play store or Apple app store is such a bigger platform. There are more than two million apps available to make your work easy. So install from the same official app stores & avoid/ save yourself from installing apps from unknown sources. The second option here is, I mean it is so common. You see anyone, all android users are doing this action very often in most of the cases. After every little time, they open recent app's button & swipe whatever apps are there inside it. They kill it by thinking that their phone is getting faster, their RAM is getting clean, their phone will become fast, super fast, it will fly like a rocket (LOL). Don't know what they think, only they know. But it is harmful doing this to your phone because android is smart for itself. There are so much functionality and ability in the Android processor that it knows how to manage your phone memory. It will automatically clean some recent apps when RAM get reduced. It will automatically create space for new apps. You do it, again and again, thinking that your phone becomes fast, whereas e.g if you close any apps like you killed it & after this if you again open it then it starts again with zero. All its data load again and this ultimately puts a load on the processor, even on battery. So instead of killing the recent apps, leaving the apps in the background is good for you. The next name in this list is Antivirus. Oh! What to say about this Antivirus apps. I mean as soon as they brought a new phone, they need an antivirus from day one. That's because everyone feels like phone's security should be tight. It is a different thing to use in computers as it is necessary there. But there is no need for antivirus in phones, especially for new Android devices. Antivirus is necessary for those who have very sensitive information and need to lock it down and being getting monitored. As long as you are downloading the apps from trusted sources, you are making use of Play Store to download the apps, you are downloading the content from official websites (like downloading YouTube videos); that is, you are doing from reputed websites; then in such cases, there is no need of Antivirus. But still, as our (orthodox) mindset is like this, therefore on these apps, there are millions & millions of downloads, as because the users have a fear of virus in their mind, and very worried about their privacy. Don't worry, there is no such things are going to happen suddenly. It doesn't matter even if you don't install Antivirus. But still, many are thinking that they should install the Antivirus and it is totally wrong. If you install an Antivirus, in return it will cause the extra load on the processor & drain more battery. Check the recent publication; 9 Best Ways To Fix Android Battery Drain Issues Yes, it is a different thing if you get some extra features from Antivirus software it will burn more processes to run its functions, otherwise, it is also harmful to the battery. If you feel you are getting tracked or monitor by any, then you can try with any security apps, but why to install an Antivirus without any reason. The next point here is also related to the battery. We want battery & we want it should stay full from morning to night and that is why we use different types of battery saver apps so that our battery should last long and we think this battery saver will save the battery. Do you know what this battery saver does? It keeps itself engaging in killing the apps running in the background. You open any apps, it will kill the app successfully as soon as you close it. It keeps doing this, again and again, this instead puts the load on your battery. Moreover, besides this, it does some basic work like it automatically switches off the Wi-Fi, Bluetooth, GPS whenever there is no need. You can do this yourself too so there is no need to use battery saver for this. So please don't install battery saver in your phone, this is of no use. The next item here is of fake apps. Fake apps mean they will allow you to play 'NFS Most Wanted' in Android phone & if you search on youtube, you will find full of related videos. Means such type of apps whose are not going to work genuinely. Even if you search on youtube e.g if the Indian government has launched a new app (Aadhaar Card app), then you will find there are thousands of other apps similar to it. The first thing it does nothing means of no use & second it can harm your phone instead. You will also get to see different types of things like, you do this to your phone or install some features inside your phone e.g your phone doesn't have fast charging but 'blah blah' app which will double your charging. Your phone doesn't have Face recognition, but 'this is an app which will make face unlocking in your phone. Means there are so many things like this which are hardly (hardware) dependent. So many apps claim that the features will come in your phone and we start using it. Many users logged in to download and think that 'yes, his phone has a fingerprint scanner now'. But this doesn't happen. These are fake apps, avoid them. Take only genuine apps to work. This won't harm your phone though. But many times they have a tendency to ask for permission or they contain more adds. Later you will have to face too much adds on your phone, so avoid using such apps. The next thing here is to clear cache memory. Many of us think that the storage space in our phone must be amazing and they tend to repeatedly install different kinds of 'e' cleaner, 'b' cleaner, 'd' cleaner apps. These cleaner apps are like, just press the 'GO' button and the broom, that comes out with the clean data. There is no need to install any such app. This cache if you clean, it will absolutely clean the data. The data-base stored here is the temporary data e.g you used Google maps, now you searched some areas in maps. You have already seen something then that data has been stored on your phone. So that when the next time you open the Google maps then at least where you have been using the things will NOT be loaded again, won't be downloaded from the internet again. That is stored once in your phone, the same will come in use e.g you are using Facebook, Instagram or Browser etc. So much of files are stored in cache memory so that the application won't be reloaded after opening it again & there won't be too much load on your system and the data you have already in can be seen there again. But we are intelligent & clear the cache memory repeatedly. We use different types of inefficient apps & think that this much memory is cleared and yes we have cleaned. It is a different thing that you have cleaned it but you have lost much-downloaded data instead. So avoid this. If you still want to clean or you think that the storage is falling short then you can do manually by going in settings of that particular app. You don't need any cache cleaning app. I mean there are different types of works from which you can earn real money much per day, per week, per month. So just avoid such kind of fake apps and such kind of messages. These are of no use, all of them are fake e.g if Jio's update has come then you will receive the messages like how you can increase your Jio limit? How can you change your sim? How can you get 1GB data per day on you Airtel number? How you can earn a talk time? That means, any new thing arrives in the market, the similar messages are getting spread. So I suggest to avoid following the viral messages, all are fake. It will harm your phone instead. The next item here is of rooting. Means there is an attraction of rooting the Android phones. If the phone is bought they wanted it to be rooted. Look, I want to warn here if you know what you are doing with your device or what is the meaning of rooting or what to do next after rooting then only go to root it. But just thinking that rooting is cool, I want to root my phone, I'll root my phone & then it will do some magic with the device then please don't do it. If you don't know about rooting then don't forward your step. First, clear all the things about the root & then proceed. The next thing here, that is app's permission. You may know that recently you might get the feature in the latest Android versions where you can manually enable or disable selective permission for any apps. Now see the meaning of permission is that, there are lots of things in your phone, suppose your phone's messages are there, your contacts, your gallery, your location etc. including these, there are different types of personal things stored in your phone. Those various sorts of apps use dependability functionality e.g If you use WhatsApp and want to send a voice note to someone, then WhatsApp will ask you a permission to use the mic because it needs a mic for recording and to send a voice note. Here in this case of WhatsApp, it is fine as it is necessary. But many times there are such kinds of apps which have no link with that particular thing it wants to get permission but still it asks your permission e.g there is an app with gallery lock feature which asks you for your phone's GPS, asks your phone's location, the question is, what is the link/ resemblance it has with your location? So here I want to remind you should also have a look at what kind of permissions your working apps are using and which are those things you have to decline. But if you feel that these things are not right, these apps asking your permission without any connection/reason then avoid using those apps. It will be fine if you do it. Otherwise, your data may get exposed. There are different types of things which will come in your phone without any reason. Advertisement can also come with these unknown permissions later. So it will be better if you don't do it. The last thing here is to restart the phone. Look, it is a simple thing that our phone is made to use it for a longer period of time and to use it continuously and constantly. And to make a healthy use, sometimes the phone should be restarted occasionally. If you keep using your smartphone continuously then the data keeps building up. Means there are lots of things are getting updated and downloaded on the device storage including system files. Therefore to re-arrange and clean it once, do a fresh start. It is recommended to restart your phone once in 5 days, 7 days, 10 days, 15 days. Restart the phone regularly. Because of this, your system will load again and you will get your phone lightly fresh. Your laptop port is convenient but it won't provide enough power to charge your phone while using it. You might see that your battery isn't charging properly because the power supply on charging it on USB doesn't deliver enough current as compared to the dedicated power charger. If you want speedy charging, then go with the official power chargers. Moreover, keeping the phone on charging all over the night causes extra problems for long-term and you may face the battery heating issues. So don't keep your phone once it gets fully charged. You must be updating the apps regularly. The app updates come with the bugs fixes and better security. I suggest you to regularly check for the updates and stay updated. So these are some effective Android working tips, it is good if you follow it from now. You should remember these things for any android phone, otherwise, it can be a danger. Danger means you experience will get worse. Different types of unknown and unwanted ads will come when you unlock it again and again. Different things will then happen and you will then started to think why I took an Android phone? Do I want to see adds again and again? Do I have such things that troubling me again and again? Repeatedly that broken app. So it would be better to avoid such things.